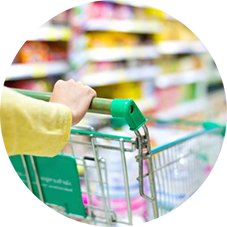 Irisys’ People Counting technology is perfectly suited for a supermarket, or other retail environments. We have worked with big brand supermarkets all over the world to install systems giving them an intelligence-lead competitive edge. Knowing more about your customers, how they shop, when they shop, and how they move through your stores, gives you a chance to improve levels of customer service to exceed expectations and encourage repeat visits. Everyone counts - so count everyone! Everyone that passes through your doors is a sales opportunity, so just looking at your checkout sales doesn’t give you a complete picture. How many of your sales opportunities are you converting? Why are you losing out on sales? People counting intelligence can help you to answer these questions, and make sure you can minimise the numbers of visitors leaving your store without making a purchase. Other factors to consider are your store environment. People counting systems can identify trends in customer activity, helping you to anticipate the numbers of staff you require at given times and improve the customer shopping experience. By making your stores a better shopping environment for your customers, the average basket size can increase, increasing your sales significantly. You can’t make good decisions if you don’t have strong business intelligence - delivered by Irisys People Counters.